So you’re looking to order some trash can liners. Black can liners? Clear can liners? Fifteen gallon liners? Trash can liners are important. White House officials need can liners to hold their shredded documents and to file away the campaign promises they never intended to keep. Yes, garbage can liners are important. One shouldn’t skimp. If you do, you’re likely to find yourself holding a busted bag and picking up garbage in a back alley. 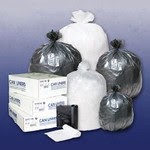 So click on www.reliablepaper.com/canliners and load up.